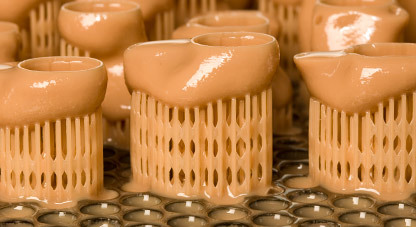 Completely personalized products are one of the core reasons 3d printing will take off. A Danish firm has taken that mentality and applied it to hearing aids. A new patient gets their ear scanned by a 3d scanner, which creates a detailed model of the inside of their ear. 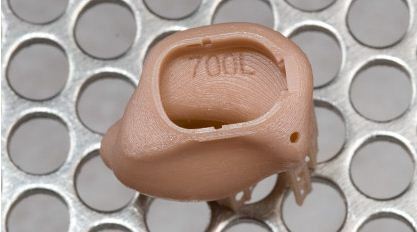 A custom hearing aid fitting is designed to match the scan, and then each hearing aid is 3d printed. Support structures are removed, and the hearing aid is hand finished to give a high quality surface. The hearing aid technology, called CAMISHA, won the European Inventor Award for 2012. The new hearing aids match the user better than traditional hearing aids, which are fitted by hand, but can’t match the contours of the inner ear like a 3d scan can. The shell can be smaller than traditional hearing aids, which makes them lighter and less visible. Since a hearing aid is something worn many hours a day, even a slight boost in comfort makes a much better product. The closer fit channels the sound better, so less volume is needed to overcome feedback. 3d scanning and 3d printing combined make the hearing aid more personalized and more usable.